Many Japanese shrines sell Omikuji oracles for 100 or 200 yen. 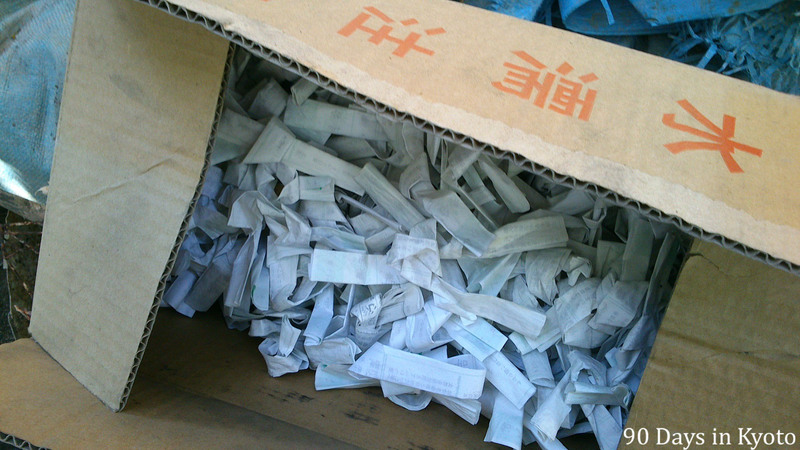 If you get one that promises you “Big luck” (大吉) or you feel that the explanation fits your situation, you usually take it home. If you find that it doesn’t fit or you rather not want it in your life, you fold it, tie it to the branches of a tree on the gate of the shrine and pray for it not to come true. ← Guess who was allowed to draw the gravel patterns in the Hojo garden today?